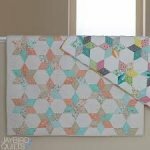 This six session class covers the basics of quilting from what tools and how to use them, picking fabrics, creating seven different blocks, adding borders, creating your quilt sandwich, and basic quilting techniques. Bring your projects at any stage and get help putting it all together. Come to one session, or all of them. Are you stuck and need assistance on a project, or just want to get away from the house, sew, and maybe socialize while you're doing it or do you need the structured time? Victoria has started a Sit and Sew every Monday. Come join in, meet new friends and get some projects completed. You can choose either the daytime or evening session - or enjoy both! A great bag for the trip to the beach or shopping with friends; there are six pockets inside the bag and the trim detail on the outside is VERY each to create. The bag is 11" wide at the top by 12-1/2" tall by 4" deep and has an easy to accomplish NO SAG bottom built in. The straps can be resized to be used as a simple tote or longer to slip over your shoulder. The front and back are mirror images but could be a terrific area to highlight a special print on either one or both sides. A wonderful design for a baby quilt, the design in the pattern finishes at 37? x 44? but could be made larger very easily. There are no ?Y? seams and the cutting is also easy with the recommended ruler.